●	Very effective in the management of all stages of Piles- even bleeding pile [Hemorrhoids]. 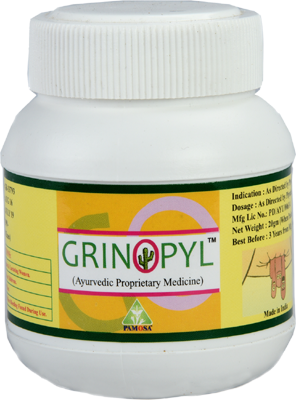 ●	Grinsons Phytoherb using water extract which is 2nd company in all India. ●	Instant relief on All grade of piles specially in operative/bleeding patients. ●	Avoid operation in piles. ●	Fistula by antimicrobial activity. ●	Water extract is more potent than crude herb. ●	Use of Pharmacology to study Ayurveda. ● Powder give more bio-avability and better absorption than tablets and capsule. Itching Recover by same drug combination. Store in dry,cool place away from moisture & direct sunlight.